Codenamed QXi, the new Hyundai compact sub 4 meter SUV will be called VENUE. 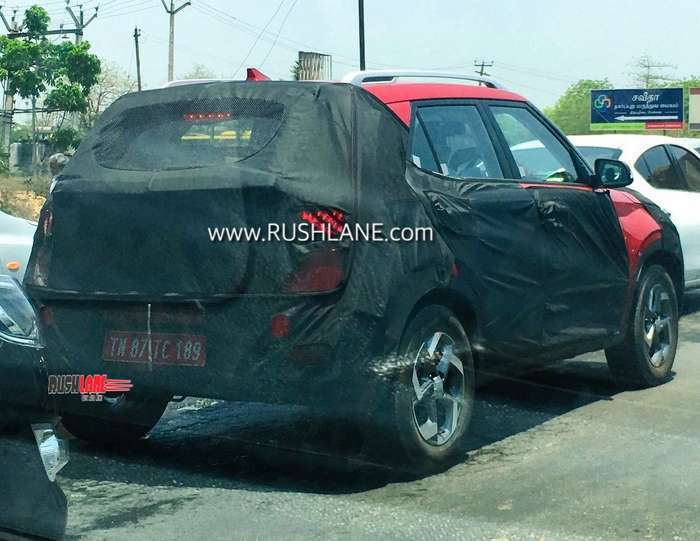 Hat tip to automotive enthusiast Selvakumar Stephen for sharing the spy shot. 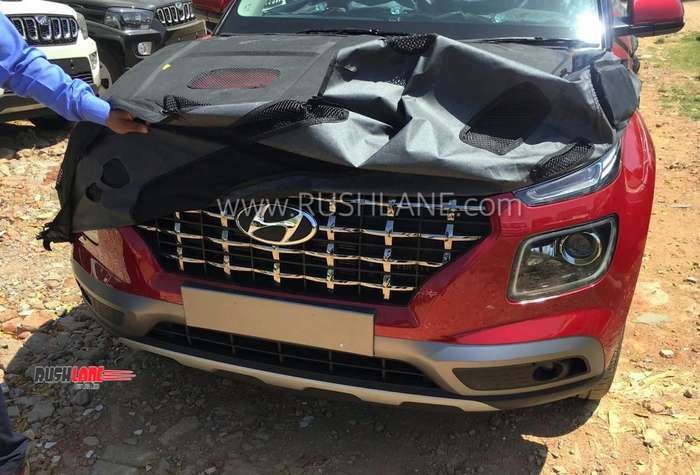 Ready to make its global debut in India, as well as at the New York Motor Show on 17th April, the new Hyundai Venue SUV has been spied once again. This time in a single mono tone Red colour. Earlier it had been spotted wearing white and black colour option. Both mono tone as well as dual tone colour option are wearing the same machine cut alloys. 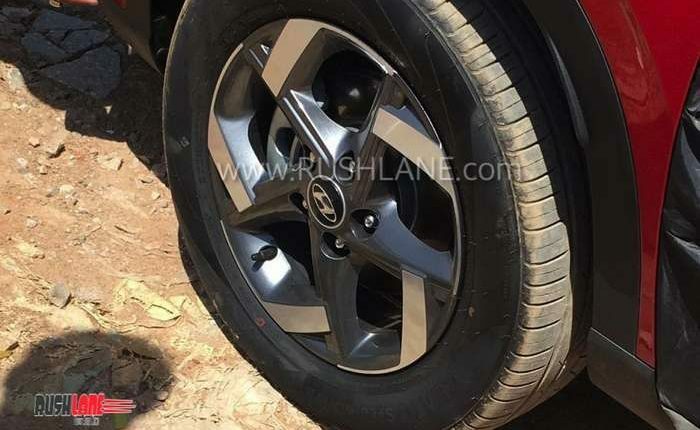 After its debut in April, Hyundai Venue will be launched in India on 21st May. It will then take on the likes of Maruti Brezza, Tata Nexon, Mahindra XUV300 and Ford EcoSport. With such rivals, Hyundai aims to make its mark by offering Venue as the first ever connected / internet enabled car of India. Yes. 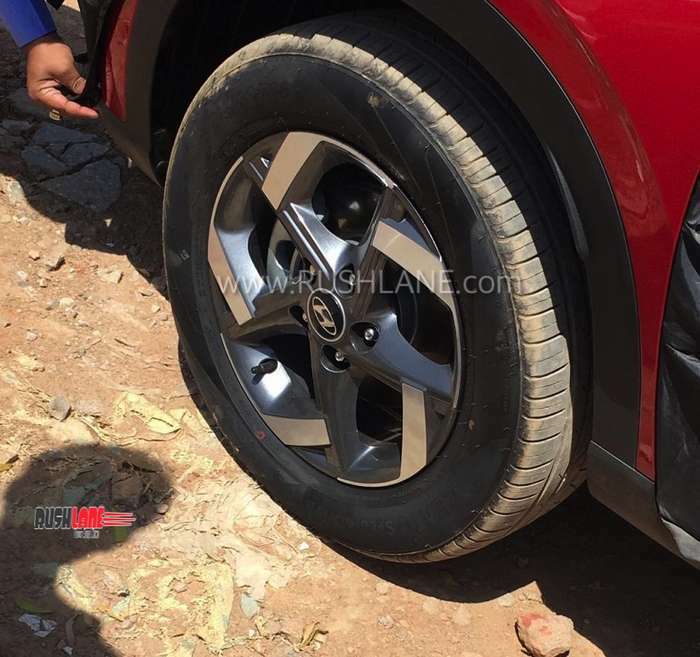 Hyundai Venue will be even more feature rich than its big bro, the Creta. Venue will come eSIM embedded into the car. 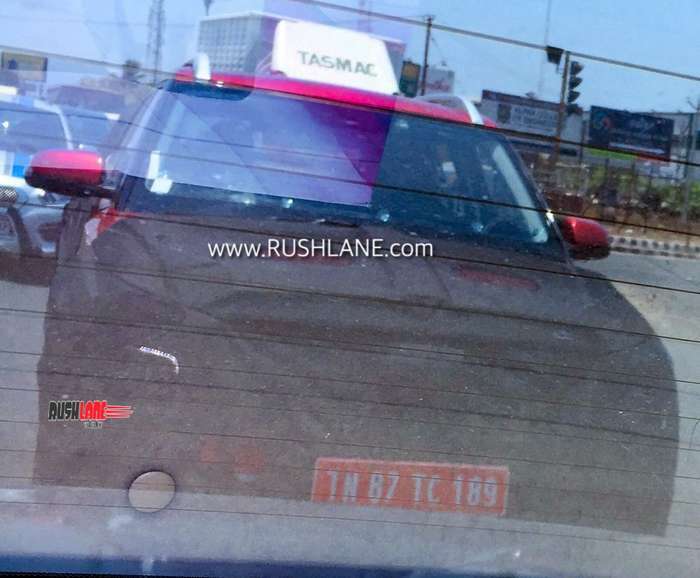 the SIM card will give the car 4G internet access via Vodafone and Idea cellular network. Owner will be able to start / stop the car remotely using smartphone app, check car’s location, control AC of the car remotely, check how the car is being driven (if given to someone else), and so on. Full list of 10 connected car features can be read here. Venue will receive new design language, which is seen on new Hyundai cars like the Santa Fe, Kona, etc. It will feature a signature hexagonal grille in a cascading design, vertically positioned LED DRLs, turn indicators and flared wheel arches. 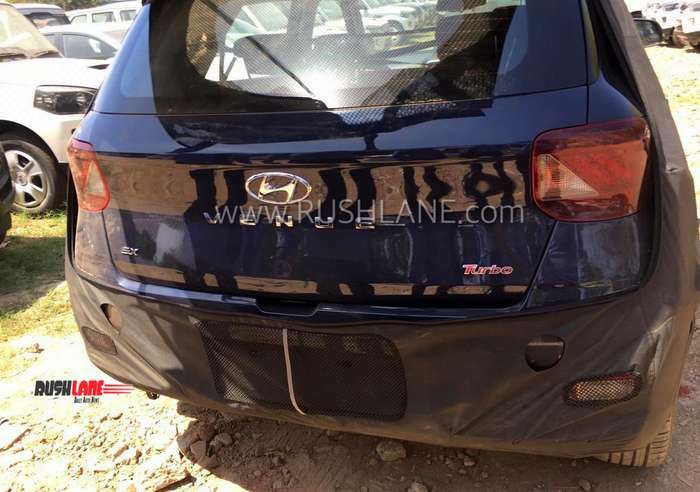 It will also receive sloping C Pillars while its tailgate will be in a similar design as seen on the Hyundai Creta. 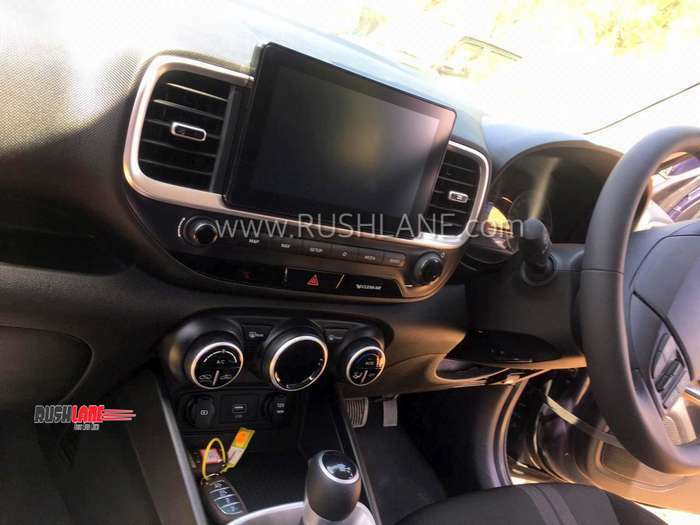 Interiors have been spied, and it is clear that they are inspired by the Creta and i20. Its cabin is seen with premium upholstery on seats along with feature such as a multi function steering wheel, rear AC vents, electric sunroof, ventilated front seats and infotainment via an 8.0” touchscreen infotainment system with Apple CarPlay and Android Auto. It will also receive a display for navigation and reverse camera. 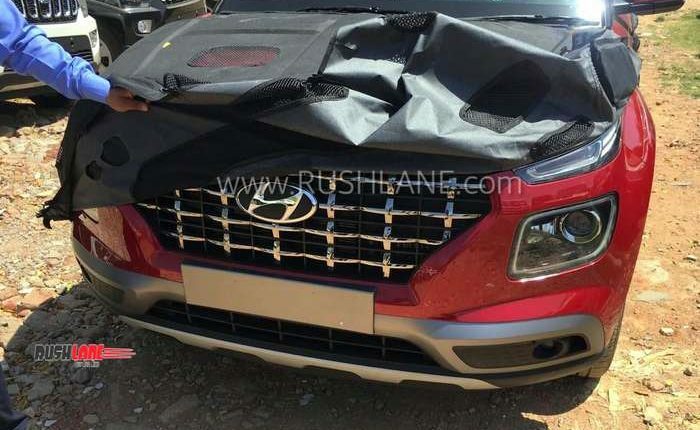 On safety front, Hyundai Venue will be seen with multiple airbags, reverse camera and parking sensors, cruise control, keyless entry, and seat belt reminder. Safety features will also include central locking, speed sensing door locks, ABS, EBD and brake assist. 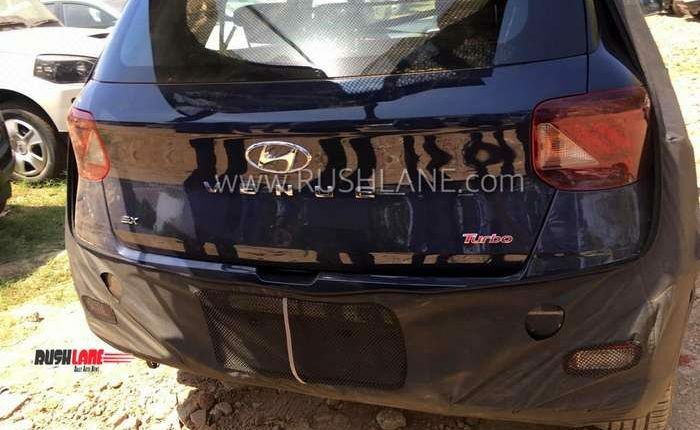 Hyundai Venue will be powered by a 1.0 liter, three cylinder, turbocharged petrol engine offering 100 bhp power and 172 Nm torque, a 1.4 liter, four cylinder petrol engine will offer 99 bhp power and 132 Nm torque and a 1.4 liter, four cylinder diesel engine will be capable of 89 bhp power and 220 Nm torque. The 1.4 liter petrol and diesel engines get mated to a 6 speed manual gearbox while the 1.0 liter turbo petrol engine gets a 7 speed dual clutch automatic transmission making the Venue the only compact SUV in India to get DCT gearbox. Launch price is expected in the range of Rs 8-12 lakhs, ex-sh. Hyundai aims to sell 7k-8k units of Venue every month in India, reveals Economic Times. If they achieve this, it will be more than any other car in the segment, except Maruti Brezza, which registers about 13k-15k unit sales every month. Tata Nexon registers about 5k unit sales, Mahindra XUV300 registers about 4.5k while Ford EcoSport registers about 3k unit monthly sales. Hyundai Venue Turbo is the new 1 liter engine variant.